"Between us - we'll have them weeping in the aisles." An official UK trailer has debuted for the latest film from acclaimed director Lone Scherfig, of the films The Riot Club, One Day and An Education (one of my favorites). Her latest is a WWII-set comedy titled Their Finest about a British film crew that attempts to boost morale by making a propaganda film after the Blitzkrieg. Gemma Arterton stars as a writer, along with an impressive ensemble including Sam Claflin, Bill Nighy, Jack Huston, Paul Ritter, Rachael Stirling, Richard E. Grant, Henry Goodman, Jake Lacy, Jeremy Irons, Eddie Marsan and Helen McCrory. This is also playing at the Sundance Film Festival coming up, and it looks like it's worth catching. Catrin lives with her struggling artist husband in WWII-era London. Assuming she is applying for a secretarial post at the Ministry of Information, she is hired to write women’s dialogue—the “slop”—for wartime propaganda shorts. Jaded veteran screenwriter Tom reluctantly acknowledges Catrin’s value, and enlists her help in writing an inspirational film about the war effort. 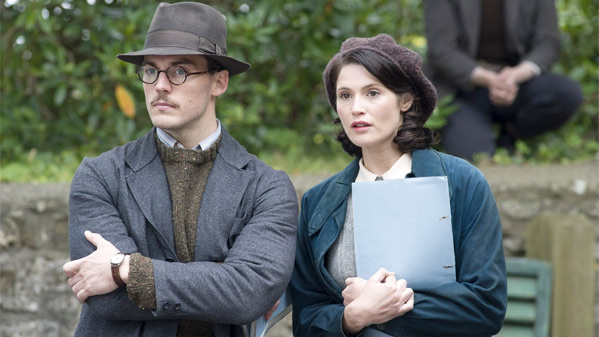 Their Finest is directed by acclaimed Danish-British filmmaker Lone Scherfig, of the films Italian for Beginners, Wilbur Wants to Kill Himself, Just Like Home, An Education, One Day and The Riot Club previously. The script is written by Gaby Chiappe, based on the novel by Lissa Evans. This premiered at the Toronto and London Film Festivals last year. Scherfig's Their Finest opens in select US theaters starting March 24th this spring. Interested? Great to see Marsan in their. He is a hidden gem. Also, must have been interesting to run into Arterton on set...that was quite a movie they filmed together.